(Davao CIty Information Office / Oct. 13) — The city government wants to bolster its goal of becoming the ‘Cacao Capital of the region through the allocation of a P2-million financial assistance to the city’s cacao industry. The budget will be under the cacao production program of the City Agriculturist Office (CAO). 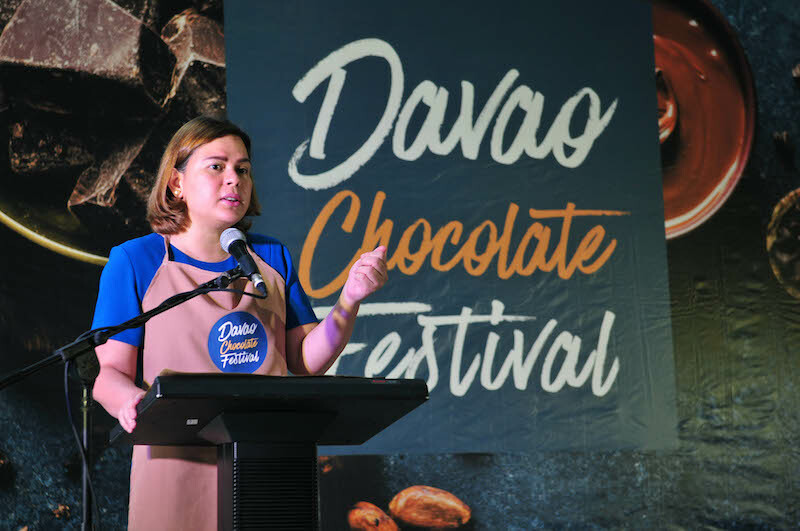 “For next year’s budget, we have set P2 million to the cacao industry and you can check that with CAO,” Mayor Sara Duterte said during the opening of the Cacao Festival at SM City Ecoland Annex yesterday. She said the city government is grateful to SM and the Cacao Industry Development Association of Mindanao, Inc. (Cidami) for promoting the cacao industry in the region. “We have exponentially grown our economy since the discovery of our potential to produce cacao and chocolate products. Identifying that we can supply at least 80 percent of our country’s total cacao production, Davao Region is now moving towards the prestigious name as the Chocolate Capital of the Philippines,” she said. Very recently, the local government opened Cacao City at the Pasalubong Center. It is a ‘chocolate cafe’ that also serves as an outlet for cacao products, including chocolates. The mayor said the city government and the cacao industry have a common vision and that is to support cacao farming, processing, research, and development. There is a goal to provide an opportunity to small entrepreneurs, farmers, and indigenous people to be major players in the cacao and chocolate industry, Mayor Inday said. “The production of globally competitive quality chocolates-all bring us together towards the aim of sustainable development,” she added. The mayor said the government’s ongoing implementation of the cacao production and marketing of dry fermented beans under the Philippine Rural Development project-Investment in Rural Enterprise and Agriculture and Fisheries productivity – with the Subasta Integrated Multipurpose Cooperative – reflects a mutual interest in this goal.